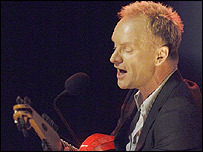 Rock singer Sting has made a big impact in the charts with an album of 16th century lute music. Songs From The Labyrinth - with tunes by King James I's favourite musician John Dowland - topped the classical chart and made 24 on the main rundown. Sting collaborated with Bosnian lutenist Edin Karamazov to make the album as authentic as possible. "For me they are pop songs. Beautiful melodies, fantastic lyrics, great accompaniments," said Sting. He added: "I feel that my job as a pop artist is to develop as a musician, and to bring into my sphere elements that aren't necessarily pop, more complex intervals, complex time signatures." He follows a trend of pop and rock musicians such as Sir Paul McCartney and Elvis Costello who have turned to classical music. A spokesman for classical record label Deustche Grammophon, which released Sting's album, said: "We're absolutely delighted. "Sting is taking an interesting area of repertoire and popularising it."